Miss World 2013 participants will be in quarantine in Bali. Totaling 141 participants will be quarantined in the Nusadua. Which is a complex of five star luxury hospitality. Region's hospitality complex, day-to-day very well guarded by security officers. Miss World 2013, which will take place in Bali, which opened on 8 September 2013, Bali police are always watching and keeping security in Bali to remain conducive, without there is something undesirable. Even Bali police asked residents to participate in maintaining security during the ifent the international standard. Local security officials in Bali, the traditional security officers in Bali, Pecalang, mobilized to participate in the security process. Much of the concern felt by the people of Bali. Given the ever occurred in Bali bomb blast that killed hundreds of people and foreign tourists. It was certainly a lesson for the police in Indonesia. To smooth this event, the police personnel deployed in 1000. 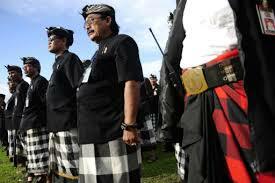 They also work together with Indonesian army officers, and security officers customary, to keep Bali remains conducive. Even that is a concern among the committee is a demonstration performed by groups and organizations that do not agree Miss World 2013 held in Indonesia. The organization threatened to hold massive demonstration, so that the international arena is not going well.